Why bother with a fortune cookie when you can sprout a bean to tell your fortune! During my Christmas shopping, I became fascinated with the Message Bean. Not that I need to have one; I want to figure out how they do this! Do you think the factory is like a minature tattoo parlor for beans? Maybe they burn right through the seed coat with a little branding iron. I think when my daughter gets bigger , we could start up our own bean tattoo parlor. 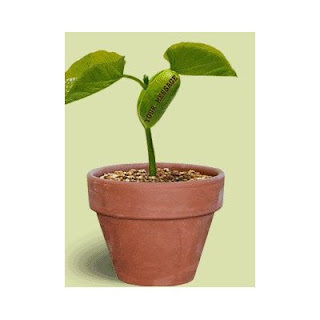 I'm guessing I could soak the bean in water, remove the seed coat, and then print right on the cotyledons before planting the seed. Botanical note: The cotyledons, the structure where the message is printed in the above picture, are the food storage organ for the developing seedling , and they eventually will dry up and fall off.